ADO.NET is not a different technology. In simple terms, you can think of ADO.NET, as a set of classes (Framework), that can be used to interact with data sources like Databases and XML files. This data can, then be consumed in any .NET application. ADO stands for Microsoft ActiveX Data Objects. 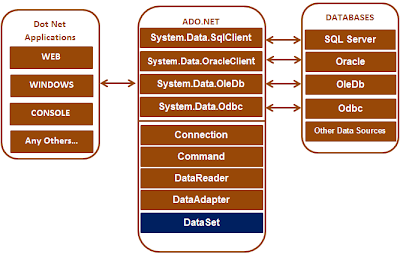 The following are, a few of the different types of .NET applications that use ADO.NET to connect to a database, execute commands, and retrieve data. What are .NET Data Providers? Sample ADO.NET code to connect to SQL Server Database and retrieve data. Notice that we are using SQLConnection, SQLCommand and SQLDataReader classes . All the objects are prefixed with the word SQL. All these classes are present in System.Data.SqlClient namespace. So, we can say that the .NET data provider for SQL Server is System.Data.SqlClient. Sample ADO.NET code to connect to Oracle Database and retrieve data. Notice that we are using OracleConnection, OracleCommand and OracleDataReader classes . All the objects are prefixed with the word Oracle. All these classes are present in System.Data.OracleClient namespace. So, we can say that the .NET data provider for Oracle is System.Data.OracleClient. If we want to connect to OLEDB datasources like Excel, Access etc, we can use OleDbConnection, OleDbCommand and OleDbDataReader classes. So, .NET data provider for OLEDB is System.Data.OleDb. The DataSet object is not provider specific. Once we connect to a Database, execute command, and retrieve data into .NET application. The data can then be stored in a DataSet and work independently of the database. the following code generates an error in connection with the database says con.Open() cannot connect to Sql database. Can you post how to solve this problem? Console Applications don't have user interfaces and are run in the Command Prompt. Windows Forms applications do have user interfaces. Whereas Website Is Basically A Terminology Of Web Pages In Which The Pages Are Dynamically As Well Statically Connected To The Web Interface System And It's The Part Of Either Local Area Network (LAN) Or Remote Wide Area Network (WAN) . If You Know Client And Server Architecture Model Then The Concept Is Easily Understandable That Client Sends Request To The Web Server And The Web Server Connects And Gets And Stores To The Request And Make Information Available To You . Also There Are Many Levels Of Requests , Methods And Properties In What Way It Works etc . Basically It's Registered To Web Hosting Domains via URL etc. It's a document, typically written in plain text interspersed with formatting instructions of Hypertext Markup Language (HTML, XHTML). A webpage may incorporate elements from other websites with suitable markup anchors. Hello Sir your tutorial videos are best to understand the beginners to learn and adapt the best techniques. Just want to ask you is you can do the tutorials for creating .exe in ADO.NET with Software Copy Protection for windows application. You Are the Best Instructor Ever.You Have No Idea What You Have Done For Me.Love From Pakistan. I am fresher to ASP.NET but your tutorials inspired me to develop a Result system based on CBSE CCE pattern. I hope it would turn best and friendly to operate by our teachers. Keep on doing such Noble job.. May god bless you sir. I have watched many videos of yours,i Really really appreciate your work, its very easy to understand very helpful,i am just speech less. thanks a lot and wish me luck for the interview. 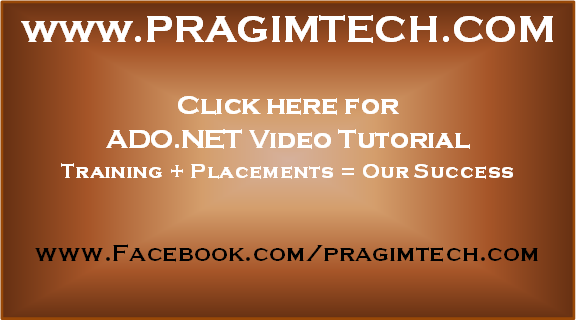 World class tutorials!! thanks alot. God bless you!! I am using Visual studio 2012 and SQL server 2014. Please provide the detailed explanation to fix this issue? Exception Details: System.Data.SqlClient.SqlException: Invalid object name 'persons'. The table name persons doesn't exist in the database that you are pointing to .. so u r getting this error.. first create the table , then execute..
What is the problem hier ??? You should check your database name correctly mention in Web.config file, also check your server name. Thank you so much ! You help me a lot with this tutorial . Yua are the te best to learn C# (Sharp). one day i will come to banglore ....to thank you..
thank you very much venkat sir.....from deep of my heart.